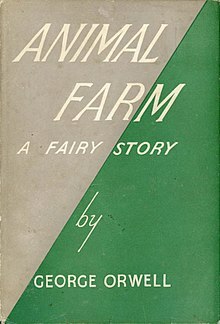 Ainimal Ferm (Inglis: Animal Farm) is an allegorical an dystopian novella bi George Orwell, first published in Ingland on 17 August 1945. Accordin tae Orwell, the beuk reflects events leadin up tae the Roushie Revolution o 1917 an then on intae the Stalinist era o the Soviet Union. Orwell, a democratic socialist, wis a creetic o Joseph Stalin an hostile tae Moscow-directit Stalinism, an attitude that wis creetically shaped bi his experiences during the Spaingie Ceevil War. The Soviet Union, he believed, haed acome a brutal dictatorship, biggit upon a cult o personality an enforced bi a reign o terror. In a letter tae Yvonne Davet, Orwell describit Ainimal Ferm as a satirical tale against Stalin ("un conte satirique contre Staline"), an in his essay "Why I Write" (1946), wrote that Ainimal Ferm wis the first beuk in which he tried, wi full consciousness o whit he wis daein, "tae fuse poleetical purpose an airteestic purpose intae ane whole". ↑ "BBC - GCSE English Literature - 'Animal Farm' - historical context (pt 1/3)". bbc.co.uk. This page wis last eeditit on 25 October 2016, at 19:44.